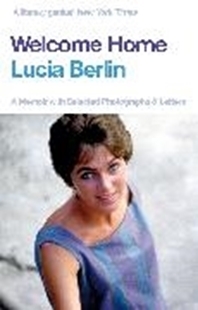 A portrait of the literary sensation and short-story master Lucia Berlin, told through a compilation of sketches, photographs and letters, from friends and lovers. Best known for her short fiction, it was upon publication of A Manual for Cleaning Women in 2015 that Lucia Belin's status as a great American writer was widely celebrated. To populate her stories - the places, relationships, the sentiments - Berlin often drew on her own rich, itinerant life. Before Berlin died, she was working on a book of previously unpublished autobiographical sketches called Welcome Home. The work consisted of more than twenty chapters that started in 1936 in Alaska and ended (prematurely) in 1966 in southern Mexico. In our publication of Welcome Home, her son Jeff Berlin is filling in the gaps with photos and letters from her eventful, romantic, and tragic life. From Alaska to Argentina, Kentucky to Mexico, New York City to Chile, Berlin's world was wide. And the writing here is, as we've come to expect, dazzling. She describes the places she lived and the people she knew with all the style and wit and heart and humour that readers fell in love with in her stories.